Witnessing a high turnout rate and eight parties entering Parliament, AK Party deputy Efkan Ala described the June 24 elections as a success for Turkish democracy. 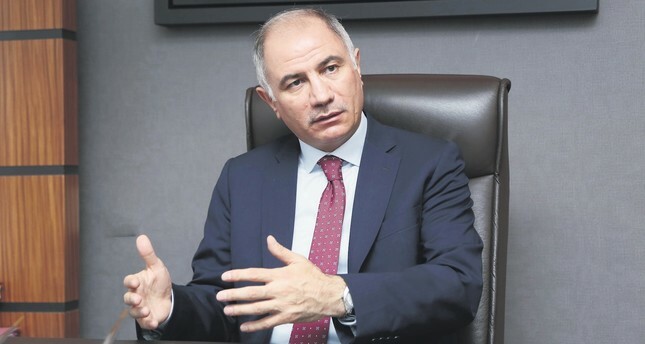 Former Interior Minister Efkan Ala, who is the Justice and Development Party's (AK Party) current Bursa deputy, said that AK Party is the most successful party in Turkish political history since the implementation of the multiparty system. In an exclusive interview on Sunday, Ala said that the party has disproved the "government fatigue" claims by winning the most recent elections. Asserting that the electoral results rendered the executive powerful and the Parliament pluralist, Ala said that the representation of a spectrum of political movements and parties will contribute to the Turkish democracy. He also stated that the new system is stronger with checks and balances. Expressing that Turkey has been working hard for the democratization of the 1982 Constitution, which was adapted after the Sept. 12, 1980 military coup, Ala asserted that most of the criticisms directed toward the presidential government system are unfair and baseless. Daily Sabah: Firstly, could you please tell us your take on the recent presidential and parliamentary elections? Efkan Ala: It's been 16 years since AK Party first came to power; I can say that it's a historical success that [Recep Tayyip] Erdoğan was elected with more than 50 percent of the votes and that the AK Party came to power once again with the highest share of votes. In the past, "government fatigue" was discussed widely in the political circles; however, AK Party started with securing 34.5 percent of the votes and increased its share of votes in elections. Now, the party has secured the majority for another five years. Our success has rendered this so-called "government fatigue" irrelevant. If your deeds are good and your policies are successful, it won't cause a fatigue; on the contrary, it carries you further with the support of the people. I believe this is a success not limited to the recent political history; it's a first since Turkey's transition into multiparty system. Our success has changed people's perception of politics for the better. Now, it will cause political parties to redefine themselves accordingly. Success begot success. It's appreciated by the people; of course, that is if you listen to the demands of the public instead of being guided by various other circles when you come to power. People continue to support you and vote for stability in Turkey. In this respect, the most recent elections were priceless. DS: Many Western news and media sources claim that the new presidential government system disproportionately empowers the president and is weak in accountability because it lacks in checks and balances. How would you respond to these allegations? EA: I believe it's the contrary. Firstly, we have changed the 1982 Constitution implemented after the 1980 coup; this constitution's writing process itself was antidemocratic. Considering that it was implemented by the military right after a military coup, we couldn't democratize it without making changes. Our amendments to this constitution are all democratic right from the beginning. It was discussed at and ratified by the Parliament; later, a referendum was held. Until the referendum took place, these amendments were discussed at popular rallies. [Nongovernmental Organizations] NGOs, political parties, proponents and opponents of these amendments all expressed their views and points. So, this process was undeniably democratic. The referendum resulted in the ratification of these amendments. Process, method and the result are equally important. Now, the people have voted for their president and political parties. We have a directly elected executive, Erdoğan. Think of a president who secured 52.5 percent of the votes in an election with an unprecedented participation rate. When any of the Western democracies have half of Turkey's electoral participation rate, they declare it a great democratic success. In comparison to what the Western democracies call a success, this is tremendously overwhelming. Meanwhile, we can talk about a complete representation in Parliament. The new system allows the president to take the decisions that will truly serve the people. It offers a swifter, more active and more transparent state organization. We continue to work on this and will implement the necessary policies as soon as possible. We now have a more accountable system. Who is responsible, who has the authority, who is tasked with what, all of this is crystal clear. Regarding Parliament, it continues to ensure basic rights and freedoms. Parliament is the sole institution to legislate; it's a pluralist parliament. The accusations that the new system lacks checks and balances are baseless. For instance, the president can't proclaim executive orders over personal rights and freedoms of people, as it's within the jurisdiction of the Parliament; in short, the president can't proclaim executive orders over matters that fall directly under the Parliament's jurisdiction. Just like Parliament has complete control over the legislation, the president has complete control over the executive; they cannot interfere with each other. This is a clear example of separation of powers and checks and balances. In addition, we continue to yearn and work for a completely democratic constitution that is inclusive and participatory. DS: It's frequently claimed that the voters convey their messages to the political parties they are supporting through voting. What is your opinion regarding this common approach? In my opinion, every party could take a message in accordance with their own disposition; however, it's clear that the people voted for the political movement, which proposed a change in the system of governance through the referendum. So, the people have asked us to realize the new system of governance and continue to walk down this path. Moreover, it has showed that the people support Turkey's 2023 and 2071 visions. Currently there are alliances between political parties that have been unseen for many years. These alliances were established prior to elections. How do you evaluate these alliances in regards to the political climate, democratic precedents and absolute representation of the public in the Parliament? When we proposed the new system of governance, some accused us tampering with the system so that we as a political party could benefit more; however, it's now clear that a simple majority of votes are necessary to have a stable executive. The alliances, on the other hand, rendered the electoral threshold irrelevant for the parliamentary elections. This allowed more political parties and movements to be directly represented in Parliament. Meanwhile, the elections led to a stable executive which will serve the people and work like a well-oiled machine. The presidential government system is established through the votes of the people. Ultimately, I believe this new system is a beneficial implementation in terms of Turkish democracy. DS: You have expressed that Turkey's constitution could be democratized further, leading to the improvement of personal rights and freedoms, and that Parliament is the only authority over this matter. So, how could allegations that the authority is gathered in one hand be rebutted? It's not gathered in one institution or a hand; it's a mis-evaluation caused by misinformation. Administration is within the president's jurisdiction, while authorization is the Parliament's territory. Meanwhile, if we had a more suitable constitution, we would implement more democratic reforms. However, considering that we're working with a constitution that is written undemocratically right after the 1980 military coup. We are trying to reform this constitution. For this reason, there are certain perceptions created over intentional misinformation in the West. When we talk with them and explain what we're dealing with, they start to reevaluate their dispositions. We should not forget that extra-democratic forces that are trying to keep the people of this country out of the government still propagate substantial propaganda and that they use this capacity to undermine Turkey. Those who are more objective and familiar with Turkey will see that the new system is more transparent, clear and democratic than the previous one. DS: Having a background in public administration and having served as the interior minister, are there aspects of the system in which Turkey is more democratic than, say, the U.S.? The U.S. is a federal state with federal institutions; Turkey is a unitary state with unitary institutions. Therefore, they are different in terms of the organization of the state. For instance, when Parliament in Turkey passes a law, the president can't amend or tamper with it; however, this isn't the case in many other countries with presidential systems. In the U.S., when a new president is sworn into the office, most of the federal prosecutors are removed from their posts. In our country, however, the president doesn't have any authority over prosecutors. Therefore, the president can't interfere with the judiciary in our system. DS: Looking at the current distribution of seats in Parliament, how would you evaluate the operability of the new system? Will there be bottlenecks? Having experience in Turkish political practices, I believe all issues within politics are eventually resolved with a little initiative. Unless extra-political actors are involved, I believe all issues can be resolved by meeting, discussing and negotiating. DS: What will be the priority topics to be discussed in Parliament? We have promised to continue the reforms processes. In our electoral manifesto, we promised 146 projects along with increasing our exports to $500 billion. We need to implement certain reforms in economy, politics and international relations to make Turkey one of world's most advanced countries. We will realize certain reforms swiftly with the new system, while the others regarding financial rights along with basic rights and freedoms will be discussed in Parliament. There surely will be negotiations in Parliament; meanwhile, we are establishing mechanisms for the presidential system that will render the decision-making process more effective and swift. Thus, we'll continue to implement reforms on both tracks which will allow Turkey to reach its goals. AK Party's reformist identity will be seen both in Parliament and in the executive. DS: The state of emergency will not be extended. How will this affect public administration and counterterrorism efforts? The state of emergency was completely situational. On the other hand, it is a democratic mechanism developed to address vital issues or threats in a country. When its application is no longer needed, it will be annulled. We've promised the people to implement necessary laws that will render the state of emergency unnecessary during our electoral campaign. As you know, it was declared to ease the state's fight against FETÖ and other terrorist organizations; it had minimal effect on the everyday social and economic lives of people. DS: Will you continue to explain all of these topics to your counterparts abroad? Will Parliament face outward more in the new term? We have been doing it for some time; however, we needed to it more especially after FETÖ's July 15 2016 failed coup attempt. We will explain it to international organizations and other countries; as I've said, we're doing this right now but we have to do more. It's crucial. It's not clear to others why we're fighting against FETÖ and what FETÖ has done. Rationally explaining what has transpired with the FETÖ is more effective, especially when you explain it with examples they can draw on. For instance, when you go to the U.K. and ask them to imagine that queen is wiretapped through the joint decision of a police and a judge. It's terrifying for them. When you give such an example, they're astounded. If such an event took place there, it would shake the very foundations of their country; the perpetrators of such a crime would be accused of treason and punished accordingly. We explain that the equivalent of what we made them suppose happened in Turkey. It takes time to cleanse all public institutions from terrorists and their affiliates. Our system is a bit different here; mechanisms may work in the favor of bureaucracy. For instance, you remove a certain FETÖ member from their post but the judiciary returns them to their post. Then you see that they have high ranking members within the judiciary, for instance at the Council of Judges and Prosecutors, who spoil the evidence and decide in the favor of the FETÖ member. For this reason, the fight against FETÖ takes time. This isn't the case in most of the countries; they have mechanisms that resolve these issues swiftly. So, explaining all of these issues, they start to understand the dire nature of our situation. We have to focus on expressing what we're facing and fighting against. We tell them to not judge us by situational and conditional measures. Our aim is clear; we do reforms and will do more. DS: What would be your response to the demands asking Turkey to change its counterterrorism laws, especially the ones made by the EU? No person could be punished for their choice of occupation; if a journalist is punished for their journalistic activities, it's a problem. However, if a journalist is imprisoned because of a terrorist activity, it's a result of counterterrorism. There are frequent waves of misinformation and slanderous campaign regarding these issues. It's our duty to explain why they are imprisoned. DS: Do you want to add anything? Turkey's aim is true, so is its method. We will realize more reforms and continue to walk down this path. We will do whatever we can in terms of democracy, economy and reforms to reach our goals.